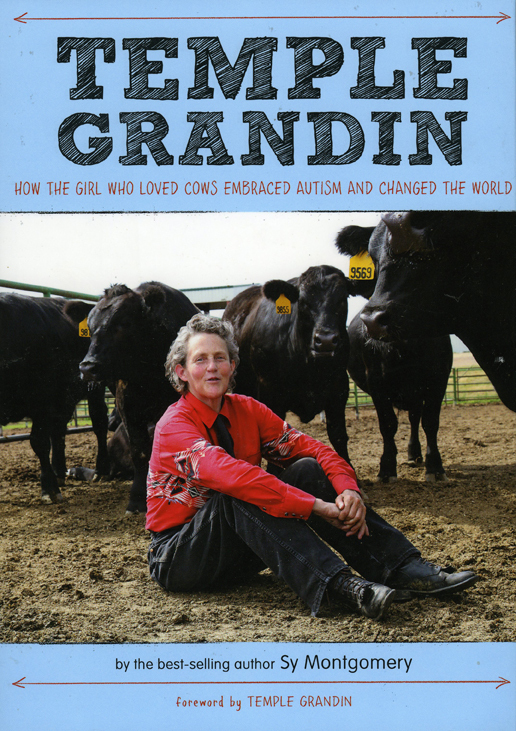 Temple Grandin : How the Girl Who Loved Cows Embraced Autism and Changed the World, by Sy Montgomery. Houghton Mifflin Harcourt, 2012. This is an effective and truly engaging biography that communicates a prodigious amount of information about autism. Temple Grandin, a pioneer for the humane treatment of animals by both the livestock and food industries, dealt with and learned to manage autism. Both cursed and blessed by autism, Temple, with the support and assistance of family and educators, learned to utilize the special talents she possessed because of the disorder to revolutionize the treatment of livestock, especially cattle, as they progress through the food supply chain, from birth on the farm to dinner for humans. The story of Temple Grandin's life and achievements is fascinating in its own right, but the accurate information on autism makes the book much more than just a biography. Grandin’s story provides a great example for children about succeeding against the odds, not just because of her autism but also because of her persistence in establishing her credibility and scientific acumen as a lone woman in a male-dominated field. The book is written at a level that is high enough to make it interesting and educational, yet simple enough that middle or junior high school students could read and learn from it. Sy Montgomery is a naturalist, author, documentary scriptwriter, and radio commentator who writes for children as well as adults. Among her award-winning books are Journey of the Pink Dolphins, Spell of the Tiger, and Search for the Golden Moon Bear. She has made four trips to Peru and Brazil to study the pink dolphins of the Amazon; and on other expeditions, she was chased by an angry silverback gorilla in Zaire; bitten by a vampire bat in Costa Rica; undressed by an orangutan in Borneo; and hunted by a tiger in India. She also worked in a pit crawling with eighteen thousand snakes in Manitoba. Her latest book for adults, The Soul of an Octopus: A Surprising Exploration into the Wonder of Consciousness, was a finalist for the 2015 National Book Award. The Octopus Scientists won the 2016 AAAS/Subaru SB&F Prize for Excellence in Science Books in the Middle Grades category. Sy Montgomery reads a passage from her book Temple Grandin: How the Girl Who Loved Cows Embraced Autism and Changed the World. Sy Montgomery talks about Temple Grandin as part of the AAAS Video Book Talks.